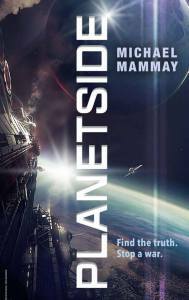 Today is July 31st, 2018, and marks the release of my friend Michael Mammay’s debut novel, Planetside. My thoughts on this book are well-known, and can be read in detail in the Goodreads review I posted yesterday. In short, if you like military sci-fi, you’ll enjoy it. Today, I thought I’d share some things about the author of the book, Michael Mammay. Getting information out of Mike is like squeezing juice from an overlarge boulder. Or pulling teeth from a hangry mountain lion. I understand it’s in his nature to keep things close to the vest. Yet over the years, I’ve slowly extracted bits and pieces of his origin story, like a Russian intelligence operative infiltrating the Manhattan Project. And because he rarely talks about himself, it falls to me to share five things about Michael Mammay that you may not know. Mike was an officer in the US Army for many years. You probably knew that already. It’s right there in his Twitter profile. What you probably don’t know is that his career began when he went to West Point. I hear that’s a pretty good school. I’d like to know more about it but honestly am a little afraid to ask. I’m sure there were lots of push-ups. He retired more than twenty years later at the rank of Colonel. You may notice that this is the same rank as Colonel Butler, the main character of Planetside. When Butler talks about how a colonel operates in the military, it comes across as genuine. Now you know why. Butler also has a bit of a drinking problem, but hey, let’s move on to #4. Mike applied to Pitch Wars in 2014, and selected me as one of four potential mentors. I think I got upwards of 50 applications that year (even as a rookie). I remember that he submitted a fantasy, but it was his name that stuck with me. Michael Mammay. But I had lots of great submissions that year, and ultimately chose someone else to mentor. That’s just how it happens, sometimes. Basic economics. Supply and demand. Mike later informed me that this still counted as rejection. That was news to me. But I went back and found his application, and noted with some amusement that it was like, 120,000 words. That’s a bit on the long side for adult fantasy, and absolutely too long to work over in the short revision period. We got to know one another over the next year. At some point, I learned about his military background and we discussed the possibility of a guest post for my Science in Sci-fi, Fact in Fantasy series. He wrote a nice article on building a fantasy army that went up on the blog in early September that year (2015). Over that year, he’d also written another novel. A kickass military sci-fi. He’d also found critique partners and really upped his game as a writer. He submitted it to Pitch Wars. But because we’d worked together on the blog post, he felt it would be inappropriate to apply to me as a mentor with this shiny new manuscript. It was either a noble thing to do or a slap in the face; I’m still not sure. All of the mentors to which Mike DID submit thought it was good. They also felt it was right up Dan Koboldt’s alley. They said “Dan, check this out, it’s perfect for you.” They graciously allowed me to see the manuscript, and when I liked it, they stepped aside. Such is the nature of the Pitch Wars community. So I reached out to Mike and told him that everyone he applied to had hated his manuscript, but I’d like choose him as a charity case (I’m nothing if not vengeful). Over the next several months, I watched Mike work very hard to improve a book that, in my opinion, was already pretty good. I wasn’t the first to critique it, and I absolutely wasn’t the last, either. He landed a literary agent who provided detailed notes, and then her boss worked it over again. Each time, Mike put his shoulder to the grindstone and got to work. The result is the excellent book that came out today. Fun fact: Mike became my critique partner and he works just as hard on that. He gives insightful, detailed notes and he turns them around fast for me because I’m a painfully slow writer. He started co-mentoring Pitch Wars with me and I think we’re a pretty good team. At least 60% of that team is Michael Mammay, but don’t tell him I said that. Mike already wrote the sequel to Planetside. It’s awesome. I imagine that it will be out sometime in 2019. He’s already hard at work on yet another book that I expect will be equally if not more awesome. Thanks for the sneak peak into the Michael. >.> I quite enjoyed this post! I was lucky enough to snag a copy of the book on E Shaver Books before they ran out. Can’t wait till my copy arrives. Also, out of professional curiosity: Do you know if Michael had any title issues because of the Sony “PlanetSide” MMO franchise? I smiled at your comment that 120k was too long to rework in Pitchwars (it’s definitely too long to market). I was in the same Pitchwars 2015 cohort as Mike ultimately was*, with a 120k adult fantasy, which came out the other end of the process as a 100k adult fantasy, having been completely rewritten along the way. It’s a _lot_ of work, but not impossible (though it probably demands someone able to devote all of their time to it). * And I think we’d all say the same about him**. ** Colonel, huh? Somehow he’s never mentioned that.